For the past year or so, those of us living in Santa Barbara and Ventura Counties in California have been sitting on the edges of our seats, wondering when the next alert will come on our phones advising us of a fire or mudslide evacuation. While we’re grateful for the alerts, and the efforts to save both homes and lives, living with this type of tension definitely brings a mind shift to many of us in our community. The biggest mind shift occurs in those whose homes were destroyed or ruined. 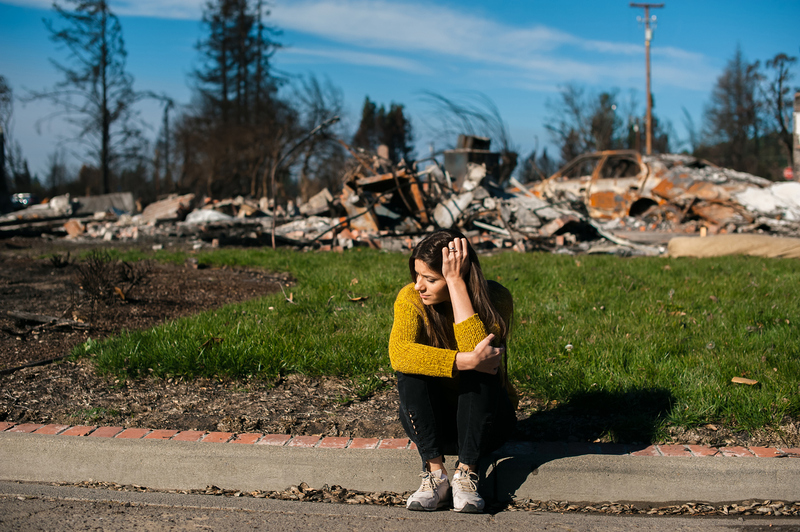 Since January 9, 2018, when so many houses were leveled by mudslides, hearing the sound of rain or merely the word evacuation evokes a deep form of PTSD (post-traumatic stress disorder) in many of us. Another thing I’ve noticed is that my friends who’ve lost homes have had a different kind of shift that has to do with their priorities. They’ve learned what’s important to hold on to and what they can let go of. In his book No Mud, No Lotus, Thich Nhat Hanh says that the first step to creating joy and happiness is to cast off what needs to be left behind. But although we do need to let go, we can’t forget about the disaster that we lived through in those early hours of the morning when just about everybody was asleep, and a massive mudslide poured down from the surrounding mountains, crashing down onto our lovely community. Being awakened by horrendous crashing sounds and bursts of fire is not something one easily forgets. In the aftermath, 128 homes were destroyed, 307 were damaged, and there were more than 21 deaths and multiple injuries. When living through a natural disaster, we can’t help but have a worldview shift. We learn to appreciate all those we might have taken for granted, such as first responders like police officers and fire fighters. During the debris flow, these men and women were our heroes, working to save lives through their own extreme mental and physical exhaustion. Everyone’s senses and priorities were heightened and tested then, and they continue to be, even now, one year later. We also learned to appreciate the simple joy and freedom of getting into our cars and going wherever we wanted or needed to go, whether it was going to a restaurant or just paying a visit to a friend. In the aftermath of the disaster, the freeways were closed, and within moments, our quaint, close-knit town of Montecito became an island without power. Rescuers had to climb over fences to get to debris-flow victims. One woman was standing in mud almost to her forehead, and all the rescuers could see were the whites of her eyes. My dear friend Tristine, an avid reader, recommended that I read writer and activist Rebecca Solnit’s thought-provoking book, A Paradise Built in Hell (2010), where she shares her experience during and after the San Francisco earthquakes. She wrote about the mind shift communities enter into because of the deep need for interconnectedness during challenging times. She also talked about how communities realize their roles in showing their generosity, altruism, and self-sacrifice. This coming-together provides a channel for communication and offers emotional and psychological support during such times. Situations such as these also have a tendency to bring out the best in people. On a personal level, my husband and I, and many others, opened our homes to those who’d lost their dwellings, offering them homemade meals, shelter, and love. In his book Man’s Search for Meaning, psychiatrist and writer Viktor Frankl, who survived the Nazi concentration camps, wrote about why some people lived through the Holocaust while others did not. He found that those who had meaning in their lives and a reason for being had better chances of survival. In other words, many of those who perished were those who’d lost their sense of purpose. He also concluded that what keeps humanity going is the striving and struggling for a worthwhile goal, and that tension-free situations are not necessarily fruitful ones. While the shock of the event was surreal and almost too much to fathom, one thing became clear: the experience was a reminder to all of us to focus on living in the present moment and to not be overly concerned with material goods. Fighting for one’s survival is certainly one way of realizing the preciousness of life and getting back to basics. Solnit said, “Disaster could be called a crash course in Buddhist principles of compassion for all beings of nonattachment, of abandoning the illusion of one’s sense of separateness, of being fully present, and of awareness. . . .” Without warning, everything we thought was important became less so as we got in touch with our higher, more evolved selves. Disasters offer a respite from everyday activities. People unite during difficult times. Such incidents remind us of the importance of mindfulness. Upheavals have the capability to transform us. There’s no question that suffering and loss transforms us, especially when challenging experiences are shared. I saw a poster in Montecito after the mudslide that said: “Everything is a teacher . . . love, strength, and healing to all,” and may the healing continue. Diana Raab, PhD, is a memoirist, poet, blogger, speaker, and award-winning author of nine books. She’s been published in over 1000 publications. She frequently speaks and teaches on writing for healing and transformation. Her latest book is Writing for Bliss: A Seven-Step Program for Telling Your Story and Transforming Your Life. Visit: dianaraab.com.